In this online and digital medium, peoples are watching the news on their Smartphone, tablets, and laptops. Online news medium is more trending compare to the offline news channel. Start your online news publishing website business by using our Tech News Script and earn high profit from the script. In the home screen, the user can view the various news posts with the title and news image. The registered user can search the news by desired keywords, country, and category. Every news is categorized by the various categories. The major categories of the news are business, tech, lifestyle, videos, travel and more. After selecting the specific news, the member can read the entire news with detailed information. Each news contains the media such as images and videos. The user can share the news details with social network and can post a comment. The registered members can sign up for the newsletter in our Multi language News Publishing Script and get the newsletter from the site. The major features of our news management script are advanced search option, newsletter, attractive user interface, user-friendly and powerful admin dashboard, popular and latest posts, media, comments, news management, team management, advanced settings, advertisement, tags, and many more. The main revenue models of the PHP Online Magazine News Portal Script for the admin are Google Ad sense, banner advertisement, and sponsored listings. The reader can view the various advertisements on a business name and each advertisement has the link. In our script, the admin can publish all the recent and tech news frequently and earn high profit from the business. Without any programming skills and technical skills, the admin can easily handle and manage the post, media, news, comments, feedback and many more. The admin can view the comments, pages, and news at a glance. All news posts are managed by the admin and can filter by using date, and category. 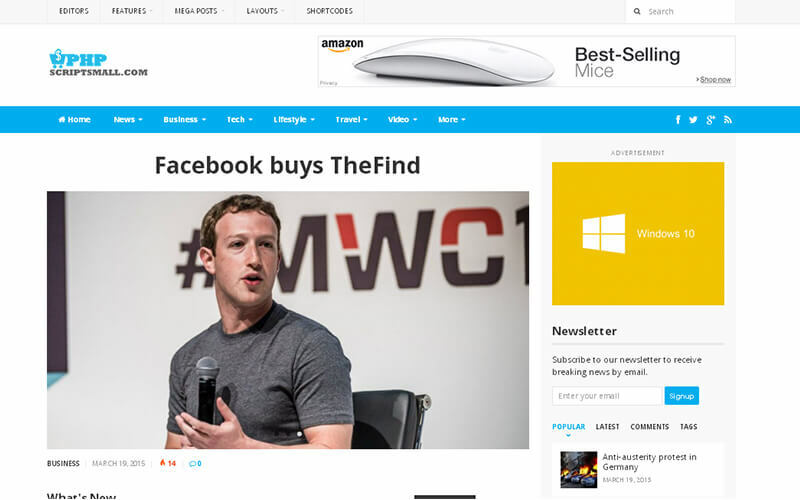 The News Portal Script is developed by the WordPress with rich themes and advanced plugin. The major advantages of our news script are SEO optimized and Responsive design. So the readers can view the website in all types of mobile devices, mobile phones, tablets, and laptops. For this PHP Online Magazine News Portal Script, we provide 1-year technical support, 6 month free updates of the source code and brand free website. We are the top Web Design and Web Development Company providing different and innovative clone Scripts to the clients with low price and high feature. Thanks for your script! it is working perfectly! I feel proud and happy that I own a script which provides the technical news happening around. The beauty is I need not spend time in collection the news because everything is getting updated automatically. It is because of this company and the developers. I thank them so much for their incredible support. Absolutely awesome design!! fast site loading and ready to use examples for the endless features, complete and easy to understand documentation. I definitely give five stars to the Tech news!! !